A lot of web based screencast services have sprouted recently. That’s not because there is a lack of good desktop screencasting applications – its because of usability. Web Services don’t need to be installed and are usually quite straight forward to use. That said, ScreenCastle is one such service, that gives you an overdose of usability. It lets you record and upload screencasts with just one click! You don’t even need to sign up and create an account. What’s the catch? continue reading. The website has a big red button on the right, clicking it launches a Java application that lets you choose the are of the screen you want to capture. There aren’t a lot of options here, and I’m guessing that it was the idea to make it straightforward. You can move the capture window around if you like and can pause between capturing. 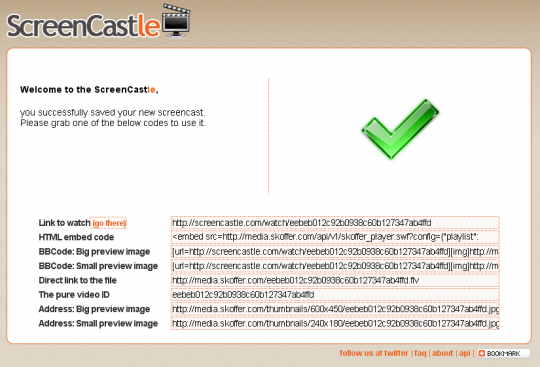 Once you have captured the video, you can save and upload it to the ScreenCastle website. From here you can embed it on any web page, and can do a number of other things. The problem with ScreenCastle is not with its design, its the quality of service. The capture frame rate isn’t good. Its between 10-15 frames per second. Even though you can capture the video in any size you want, you’re better off keeping them below 480×360. I tried to capture in HD and VGA resolutions but they seemed to run into some problems once I was done with the recording and decided to save them. I embeded a video below which I managed to capture successfully after several failed attempts. It even refused to load the video once it was uploaded to there website. Ran 15 queries in 0.177 seconds.